One keyword that stood out in all these tweets was ‘stampede’. Most tweets warned of a disaster waiting to happen. 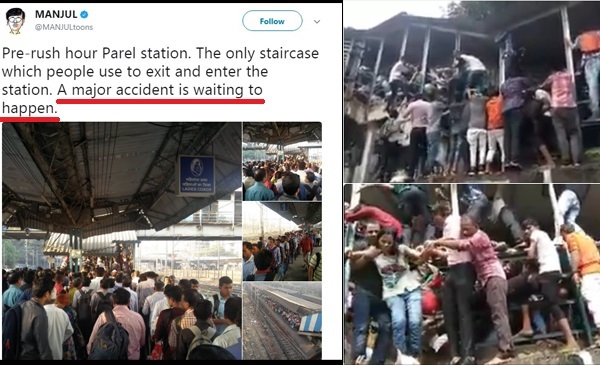 Could the horrific tragedy at Mumbai’s Elphinstone Road station have been averted? 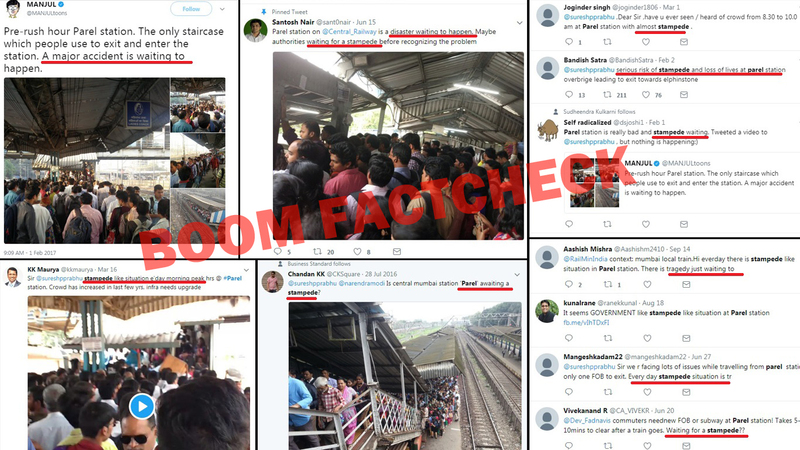 Hours after at least 22 people died in a stampede on the overbridge connecting Elphinstone and Parel stations, several citizens took to Twitter retrieving old tweets warning the railways about a possible stampede. 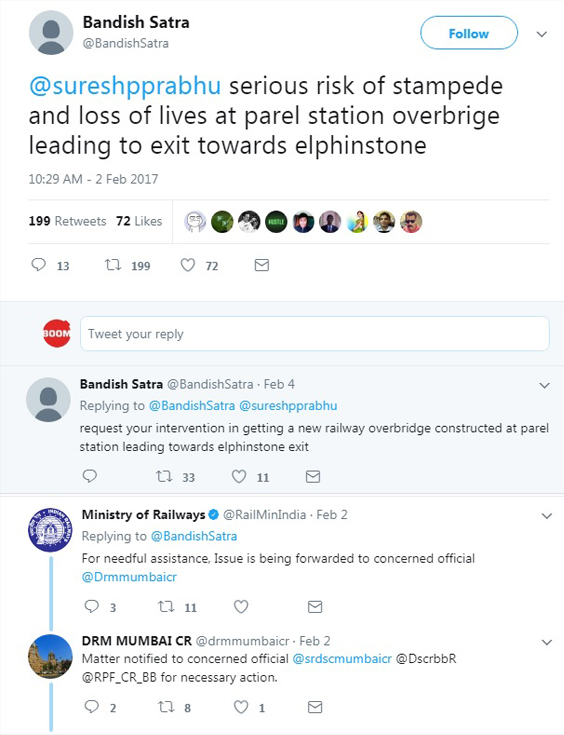 Several journalists who work at offices in the Elphinstone-Lower Parel area had also tweeted in the past tagging the then Railway Minister Suresh Prabhu reminding him of the need to widen the footbridge. 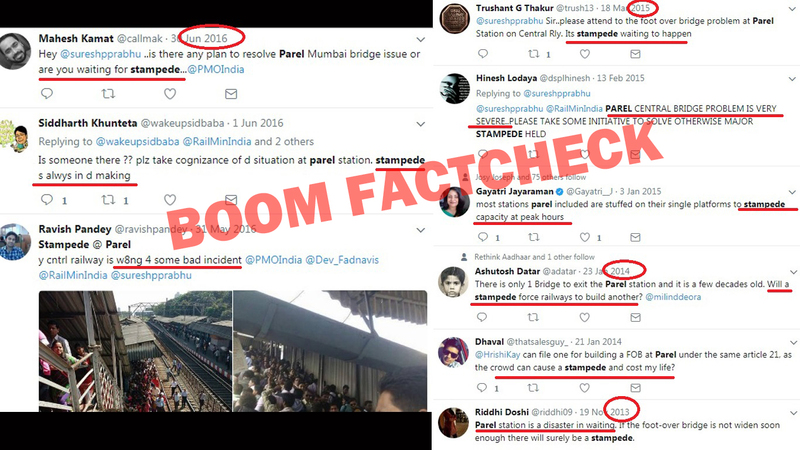 We scanned through all the tweets that were posted on the issue by concerned Mumbaikars. At last count, we found nearly 100 tweets that went back to the year 2013. One keyword that stood out in all these tweets was ‘stampede’. Most tweets warned of a disaster waiting to happen. 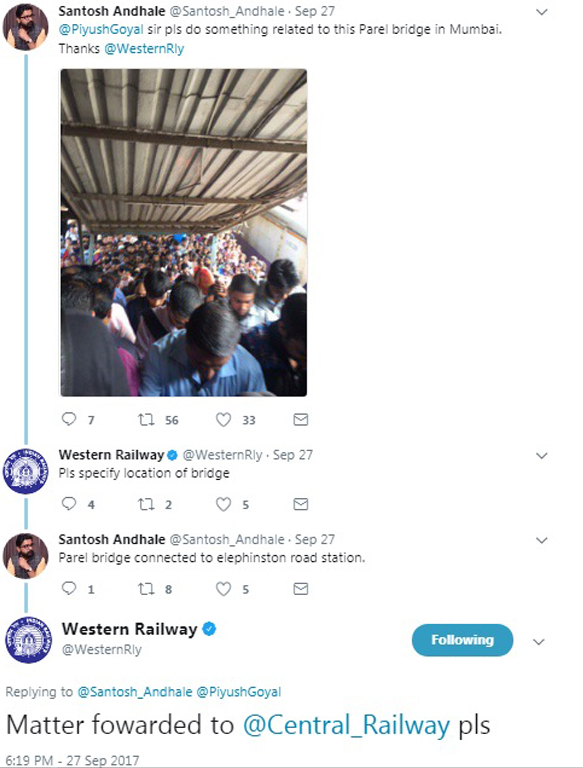 The railways did respond to some of the tweets but in standard format which promised action. The frantic warnings were not just limited to Twitter. 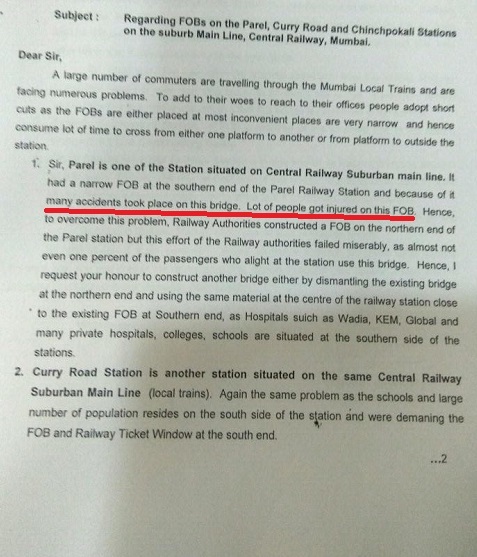 Member of Parliament from Mumbai South constituency Arvind Sawant had also written a letter to Railway Minister Sadananda Gowda on August 14, 2014 seeking foot over bridges on the Parel, Curry Road, Chinchpokli stations. 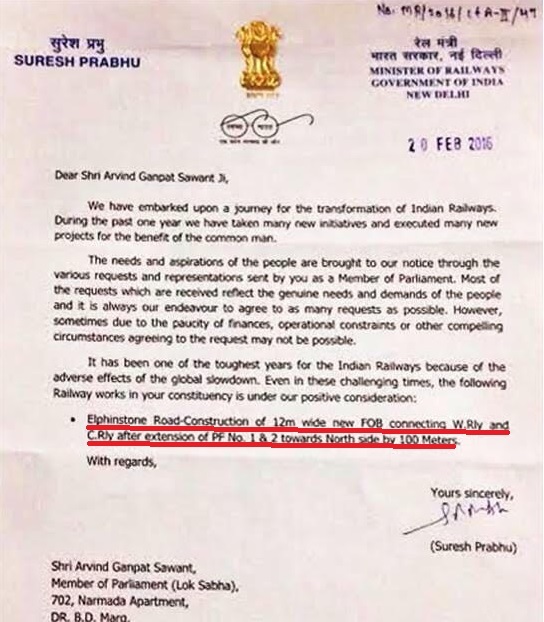 Suresh Prabhu who took over from Sadananda Gowda replied to Sawant on February 20, 2016 where he acknowledged the demands made by the MP on behalf of his constituency. He said that despite the “adverse effects of the global slowdown”, 12 m wide new FOB connecting Western Railway and Central Railway is under their positive consideration. Ministry of Railways tweeted that the proposal was approved in 2016-17 and the tenders will be opened on November 9 this year. 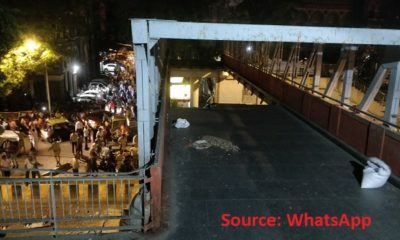 While Mumbai commuters have been travelling like cattle since last several decades, an unexpected spell of rain that caused people to throng to the bridge was a perfect storm for the tragedy to unfold. But Friday’s tragedy is a clear reminder of the dangers Mumbai commuters face on a daily basis as they travel to and fro to work. According to data journalism website IndiaSpend, more than 2.2 mn travel in peak direction on Mumbai locals between 7am & 11.30am or between 4pm & 8.30pm. Also, 8 mn passengers-more than the population of Hyderabad travel on Mumbai rail network every weekday on 2,800 services. In the past two decades, central areas of the city such as Lower Parel and Elphinstone (or Prabhadevi) have transformed from hubs of textile mills to office complexes. However, road and rail infrastructure have been unable to cope with the transformation leading to pockets of haphazard development. Elphinstone Road station was named after Lord Elphinstone, the Governor of Bombay from 1853 to 1860. Friday’s stampede occurred on a day the station was to be formally renamed as ‘ ‘Prabhadevi’ after the Hindu goddess Prabhavati Devi, whose idol dating back to the 12 century is installed inside a temple close to the station. The tragedy occurred exactly one month after the city suffered a deluge on August 29 after incessant rain, exposing once again that its creaky and outdated infrastructure can no longer cope with explosive population growth.